Join us as we take a look at some of our favourite home-made apple iCar concepts, and speculate wildly over what could and couldn’t be. Rumours hit the internet last year that before his death, Steve Jobs was entertaining the idea of moving Apple into the automotive industry. Knowing apples tendency to dominate any market it enters, we imagine we would be in for a treat if the Apple iCar did ever reach the production lines. 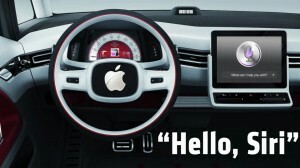 The rumour mill was heated up further when Apple advertised a job for automotive engineers. Exciting stuff! But probably more smoke than fire. Nevertheless, it makes for an interesting proposition. 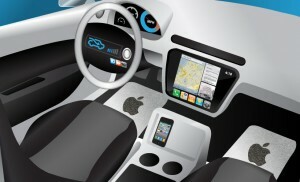 What can we expect if the Apple were to bring out what would almost definitely be known as the iCar. One thing is for sure, the control panel would be very hi-tech and user friendly. Anything that can be incorporated into a touch screen will be, should you not fare well with touch screen technology, a sneaky button on the steering wheel will put you in touch with Siri, and you can just ask him to do it. We also hope there will be a Siri like navigation system, whereby you can ask for directions whilst driving, rather than having to type them in manually before you set off. This should lead to some amusing consequences. This interior design came from Retrevo, and we like the centre console in particular. There also seems to be no gear stick, probably because changing gears manually is far too barbaric for apple users. Apples design team have had a great deal of success when it comes to the styling of their products, and we are guessing this will run consistently into their automotive effort. Those who go wild for white paint and light weight materials will go mental, going to extreme lengths to justify the purchase, even if they can’t drive. Youtube will be awash with videos of people dipping iCars in huge tubs of coke, or driving iCars off tall buildings, to prove it is well made, or make excuses when it brakes. Rice sales will go through the roof, as people try to repair there iCar without having to go through insurance. Overall though, it will look good and be well made. This is the best concept design we’ve seen so far, and we much prefer it to the city car-esque iCar designs that populate Google images. You’ll constantly find yourself throwing your money away on the latest unnecessary app that all your iFriends are using and your wife’s photos will randomly appear on your infotainment system, despite the countless times you’ve told her off for pressing the ‘Sync All’ button. On the other hand, your MOT and Servicing costs should be pretty low and residuals should be strong so selling it as a Used Car will cover some of the cost of the next model. A rival Samsung model, constant bickering between the two and their respective fans, and a bunch of pompous adverts featuring a perfectly formed finger reminding us how rubbish we are at navigating touch screens, complete with a smug slogan. This entry was posted in Concept Cars. Bookmark the permalink.